(Nanowerk News) The start of the first two-day scientific workshop at the MARUM Centre for Marine Environmental Sciences in Bremen last Monday heralds the beginning of the operative phase of the new Helmholtz research alliance “Robotic Exploration under Extreme Conditions” or ROBEX for short. In this project - unique for Germany - space travel specialists and deep-sea researchers from 15 research institutions will be jointly developing technologies for robot systems capable of conducting independent missions on the moon and in the deep sea. The dark side of the moon and the deep-sea regions of the world’s oceans belong to the most inhospitable places imaginable. Whilst the temperature curve on the dark side of the moon regularly rises to over 130 degrees Celsius, only to drop again to minus 160 degrees Celsius, the deep sea with its darkness, high water pressure and temperatures from zero to 400 degrees Celsius, is similarly most unfriendly to life and technology alike. Nevertheless, both regions have long since kindled the ambitions of discoverers: the dark side of the mood would be an ideal place for telescopes looking into space, and would reveal many a thing about the origins of the Earth’s satellite. For its part, the deep sea provides a largely unknown habitat full of surprises on our planet. It is to be explored and understood. This is a task which is more important than ever in view of the constantly growing demand for resources. However, without the right technology, both the moon and the deep sea will remain areas which are virtually closed to humans on a permanent basis. For this reason, 15 German space and marine research institutions under the leadership of the Alfred Wegener Institute, Helmholtz Centre for Polar and Marine Research, have joined forces in the Helmholtz Alliance “Robotic Exploration under Extreme Conditions” (ROBEX). They wish to share their respective specialised knowledge with the aim of jointly developing robot technologies which are able to explore the moon and the deep sea independently and primarily over long periods. “The moon and the deep sea may appear to have little in common at first glance. The fact is, however, that we are faced with the same technical challenges in the exploration of both regions. Neither for the deep sea nor for the moon has a solution so far been found, for example, as to how robot systems can move and conduct measurements a year long on their own and independently without exhausting their batteries. We seek to learn from each other in this project and jointly develop new ideas”, says Prof. Karin Lochte, scientific director of the Alfred Wegener Institute, Helmholtz Centre for Polar and Marine Research, responsible for project coordination. During the first joint scientific workshop at the Centre for Marine Environmental Sciences (MARUM) in Bremen, the project participants now wish to give their partners from the other research field an insight into their own research and explain the status of space or deep-sea technology. Using joint core questions such as those concerning the exploration and examination of extreme habitats, new joint technology projects are to be developed. “We as deep-sea researchers can learn a great deal from the space travel technologists. One example: working with them we wish to develop a control unit for the new autonomous deep-sea robot systems with which the device recognises any objects lying in its path, such as stones, and avoids them. So far we have only been using remote controlled underwater vehicles connected to us via cameras and cables. In future these vehicles are to be able to find their own way over lengthy periods of time and in the best case scenario also learn from errors”, says Dr. Frank Wenzhöfer, deep-sea expert at the Alfred Wegener Institute. The range of uses for such intelligent and independent robot systems is wide. 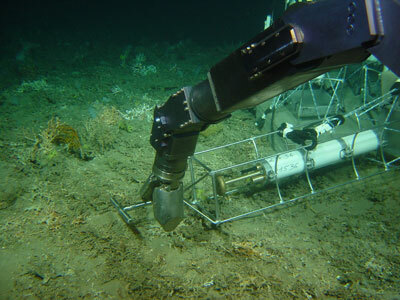 If the researchers had their way, then in future robots will not only be able to independently take soil samples from deep-sea volcanoes or on the dark side of the moon, but also help to minimise the risks of deep-sea exploration. “In view of the increasing use of the world’s oceans, we need technologies with which, for example, we can reliably monitor pipelines on the floors of the oceans or the foundations of offshore structures over long periods of time. The ROBEX developments will lay an important foundation stone here”, says ROBEX coordinator Prof. Karin Lochte from the Alfred Wegener Institute.